Marian's Roots and Rambles: Don't Throw Out Those Local History Books! You know the scenario, someone moves to a quaint New England town and they are so enamored with it that they buy all the books and pamphlets at the local historical society. Likewise, long time residents purchase the books to support the society and as a remembrance of the old days. But what about the flip side? Just as likely a number of those people move from town, transferred far away for a job. Or as I saw too often when I was a real estate agent, the older folks pass away, their children come to town for a day or two and empty the place out. In both cases those quaint local history books are likely to be tossed in the trash. The funny thing is that those local history books, while perhaps not relevant to everyone, are some of the hardest books to find. They are often printed by societies or individuals in extremely short print runs. Five or ten years later when the interest in the books has waned, they are not reprinted. Often these books which contain items of interest about the local town are available only from libraries. On occasion you might find them on eBay or an online used book seller. But some of them are so forgotten, particularly pamphlet type books celebrating bi-centennials, they are only found locally. As a house historian, local history books are one of the mainstays of my research toolbox. These books might not contain any genealogy. They may, however, have information about the development of the town, when roads were laid down, when houses were built. All clues that can help me in my work. I often go to the extreme of traveling to far away libraries to find the single copies of these long forgotten books. I have to be efficient because typically I don't have borrowing privileges in those libraries. If you see an unwanted local history book that covers towns in Massachusetts, Connecticut or Rhode Island, let me know! Those are the states that I most frequently research in. Books from any of the towns in those states would be most welcome. Perhaps your retiring parents, neighbors who are moving, or sudden empty-nester friends are cleaning house. Ask them if you can have the books and let them know they are going to a good cause. Unfortunately, I am not a big business nor independently wealthy. These books would have to be a donation to the cause of preserving the history of southern New England. I would, however, be willing to reimburse for postage. I will reimburse postage only for books that are sent MEDIA MAIL. Cost savings are more important than prompt delivery from my point of view. 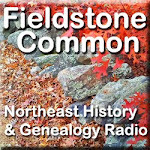 please first send an email to rambles@FieldstoneHistoricResearch.com so I can make sure I don't already have them and to let me know they are coming. Thanks so much for keeping me in mind! 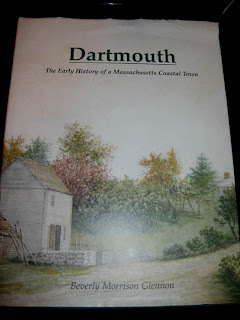 Photo Caption: Dartmouth: The Early History of a Massachusetts Coastal Town by Beverly Morrison Glennon. The book I had to go through hoops to get a copy of and found it eventually through contact with a local. We ought to have a clearing house for these. Whenever anybody finds one, put the information out there to see if anybody is interested in it. I'm be in! and I'm forever looking at used books! Just For Fun - Which Traits Are You Passing Down? Do You Prefer Books or Microfilm? Are You Reading the Right Journals?